Cynthia Giachetti and Ben Diller worked collaboratively to create this installation, specifically for the exhibition, "Uniquely Louisiana" at the LSU Museum of Art. This installation was influenced by the landscape and culture of Louisiana and examines themes of industry versus nature. This installation is also influenced by the architecture, industry and nature of the region. The light and shadows are important in making connections between these different aspects of inside/outside, domestic/industry and nature/machinery. I draw upon my experience as a carpenter, painter, printmaker, sculptor, scenic artist and installation/art installer in my artistic practice. Having moved around alot in my youth, has also informed my eclectic decision-making in studio and gallery installations. Observational drawings and templates from both the natural and industrial worlds inspire me to capture moments to distill references from. Abstraction occurs from removing source images, applying various methods and processes to suggest new entities. These blended forms hover between built structures, illusions of depth and implied narrative scenes. 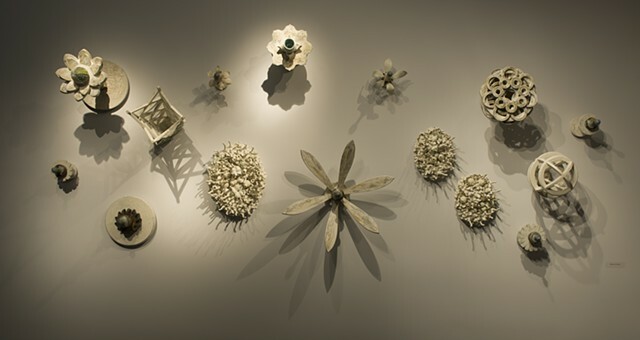 The nature of craft, systems, networks, and individual strength is continually explored as these works evolve. Oftentimes, a singular work does not convey the visual power as much as a group, collective series of works. Traditional formats are altered, removing edge restrictions, exposing the contradiction of actual to implied space. From natural to artificial color, textures, transparencies, opacities, positive and negative shapes, further reflect this development. This push-pull, between actual and implied forms, creates a dialogue between the elements, including edges in relief and shadows. Activating a key area or image that references the source, allows the work to be accessible to the viewer. In these works, I am presenting finely wrought objects that can be perceived for their aesthetic or implied functional elegance.